The year nine stu­dent won the 1500m event at the Cakaudrove Zone last month and is confident of making his school proud at the national finals. 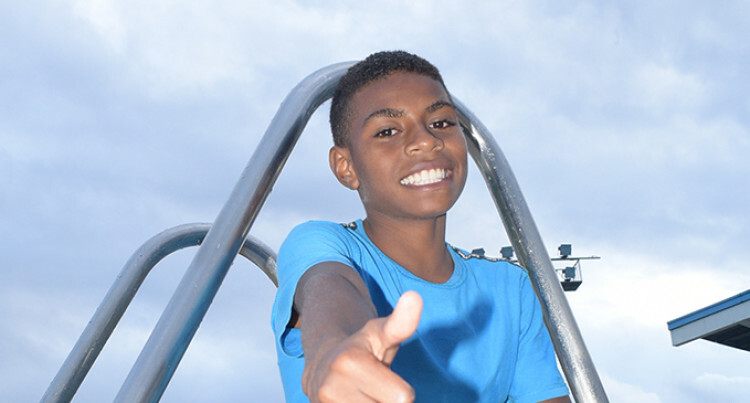 Savusavu Secondary School athlete, Penisitoni Kama is gold hopeful in 2019 Coca Cola games at Damodar Aquatic centre on April 15, 2019. Photo: Ronald Kumar. Savusavu Secondary School’s long dis­tance runner Penisitoni Kama is one to look out for in the sub-junior boys 1500m event today at the Coca-Cola games in Suva’s ANZ Stadium.The year nine stu­dent won the 1500m event at the Cakaudrove Zone last month and is confident of making his school proud at the national finals. “This is the first time for me to take part in the Coca-Cola games and I’m excited to run in both my events, which is 1500m and 800m races,” Kama said. The diminutive athlete says he pre­fers to do the talking on the rubber tracks. “I will do my best and will make my school proud,” he said. Savusavu Secondary is the boys division champion from the Cakaudrove Zone. They will field a team of seven athletes at the Coke Games. Team manager Sean Nair said: “Last year we brought in two athletes but this year we have seven poten­tial medal athletes. “We also faced financial constraints but we were thankful to have a lot of support from old scholars, who helped us come to Suva.